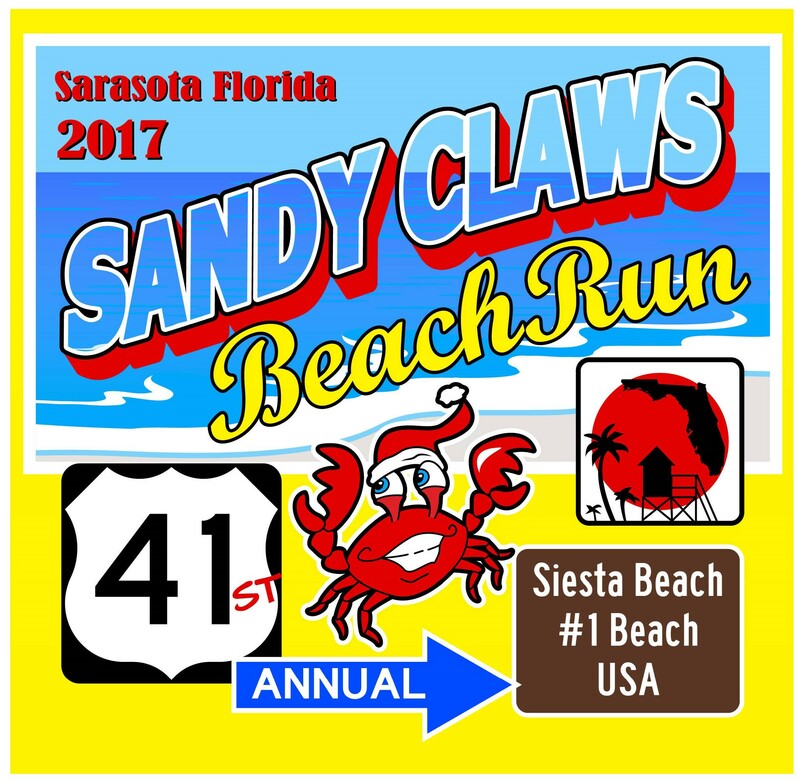 The 41st Annual Sandy Claws Beach Run 5K and 1-Mile Fun Run takes place on Saturday, Dec. 9 on beautiful Siesta Beach, #1 beach in the USA! Set a fast pace on the hard-packed world-renowned white quartz sands or enjoy a leisurely stroll along the shore. 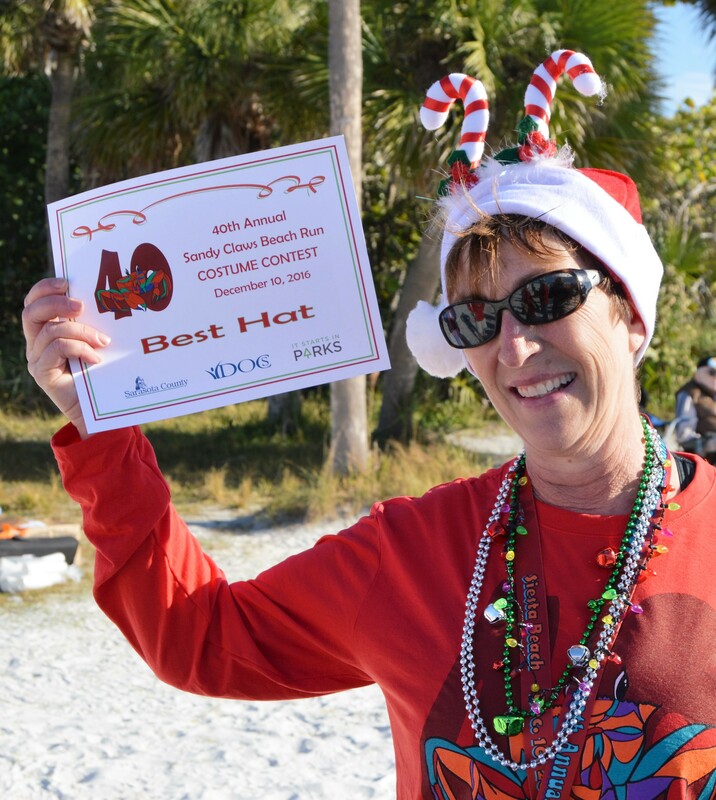 This race, co-sponsored by Sarasota County Parks, Recreation and Natural Resources and Dr. Heidi K. Anderson-DOCS, is sanctioned by the Manasota Track Club and chip-timed. Participants receive a custom finisher medal. 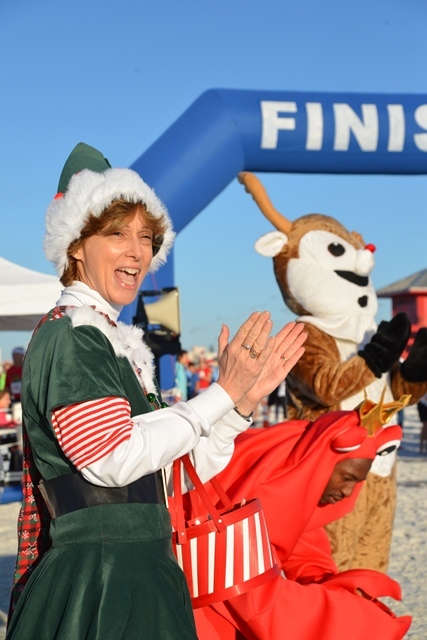 Enjoy the post-race party with music, holiday-themed costume contest, raffle prizes, holiday photo op and food and beverages. 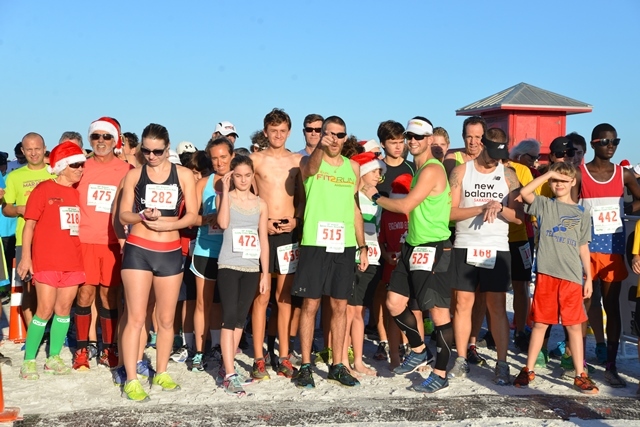 Early packet pickup party, hosted by New Balance Sarasota, 1872 Stickney Point Road, is Thursday, Dec. 7 from 3-6 p.m.
All finishers receive a custom medal. Holiday-themed costume contest including a $150 cash prize for best group contest. Check-in/Race day registration takes place on the beach near the elevated concession/restroom building. 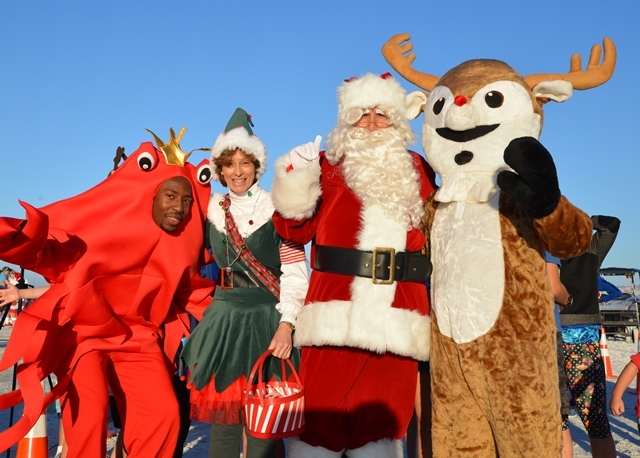 Race day registration: 7-8:05 a.m.
Holiday-themed costume contest: 9:30 a.m.
Who does this event benefit? Send a kid to camp! 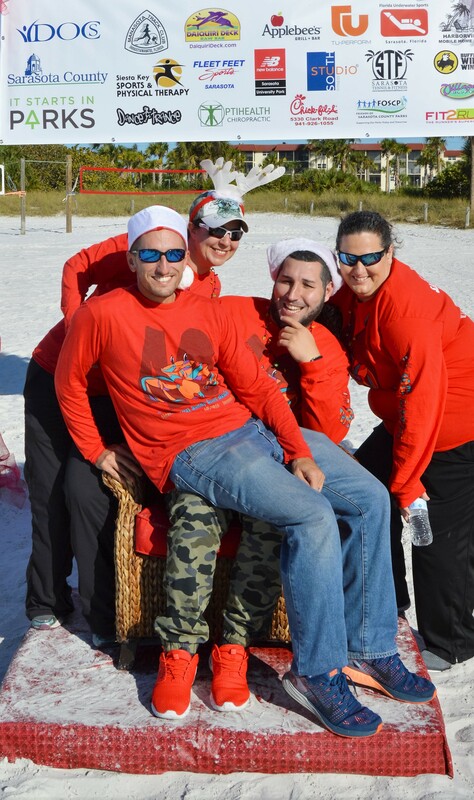 The proceeds of the Sandy Claws Beach Run benefits Adopt-A-Camper, providing financial assistance to qualifying county residents who attend a Parks, Recreation and Natural Resources summer adventure, day or therapeutic camp. Love kids? You can make an additional tax-deductible donation during registration. Where do we run? 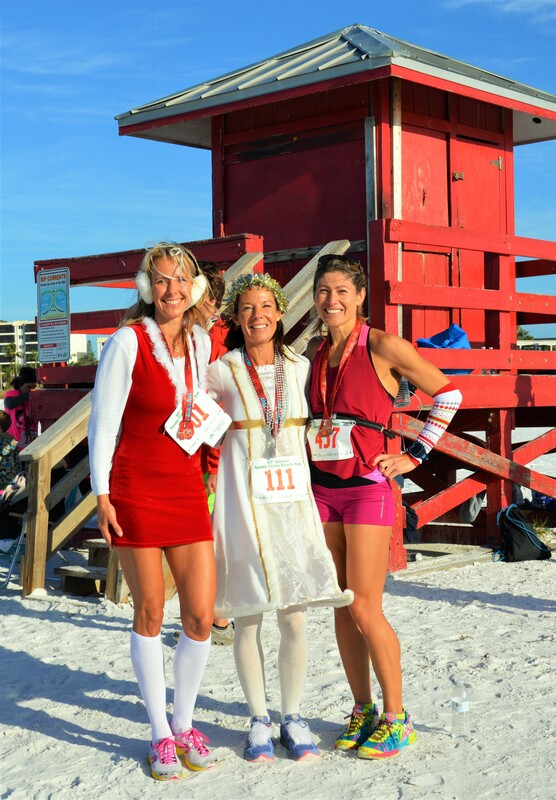 The start/finish line is near the water’s edge by the yellow lifeguard stand at Siesta Beach. 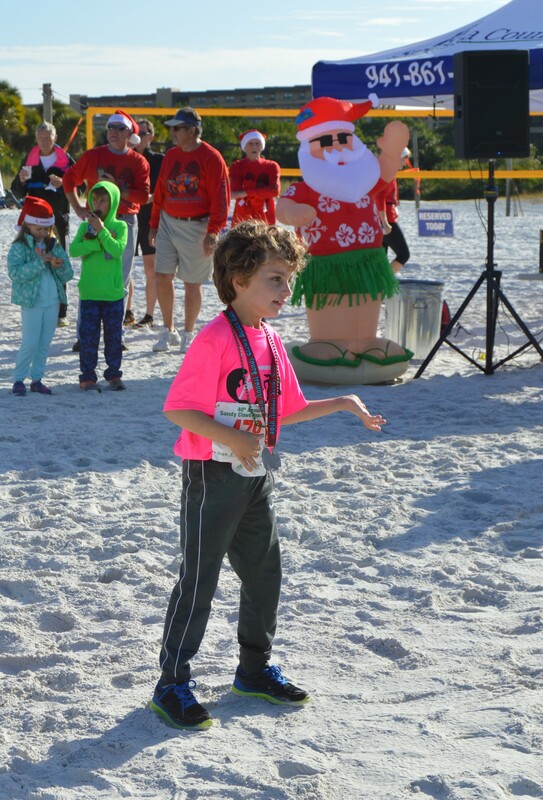 Run south on the hard-packed sand, turn around at the half-way point and return to the start/finish line. Enjoy holiday music and fun along the way. Where do I pick up my race bag and bib? 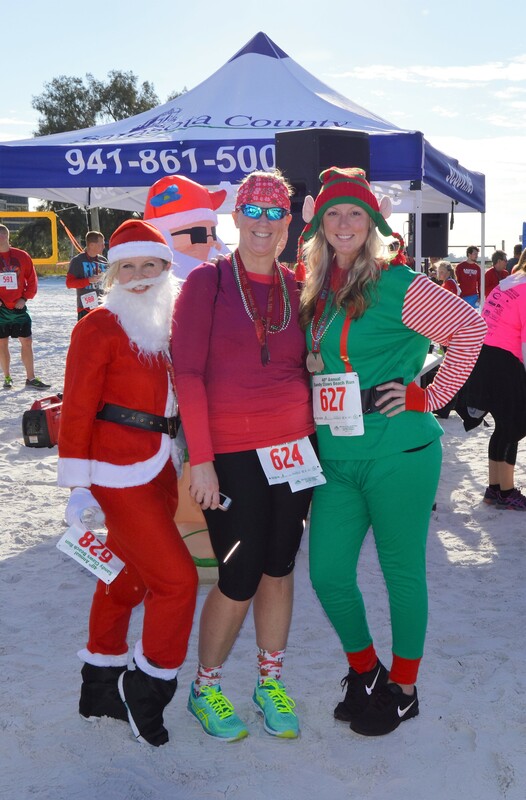 Join us at the early packet pickup party hosted by New Balance Sarasota, 1872 Stickney Point Road on Thursday, December 7, from 3-6 p.m. Or check in at the pre-registration tent the morning of the race beginning at 7 a.m.
Where do I check in and what time should I arrive? 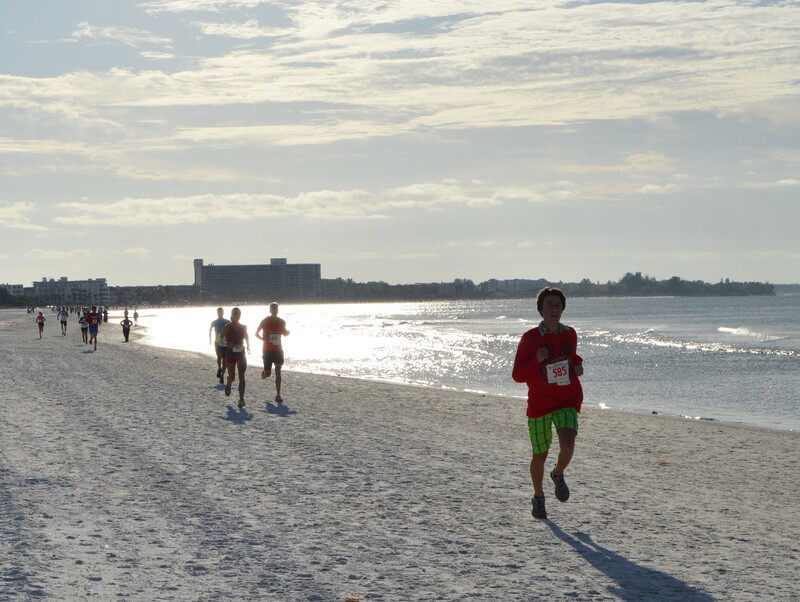 Race-day registration and packet pick-up begins at 7 a.m. on the beach near the elevated concessions/restroom building. Coffee will be available for participants and spectators. The 1-Mile Fun Run begins at 8 a.m. and the 5K at 8:20 a.m. 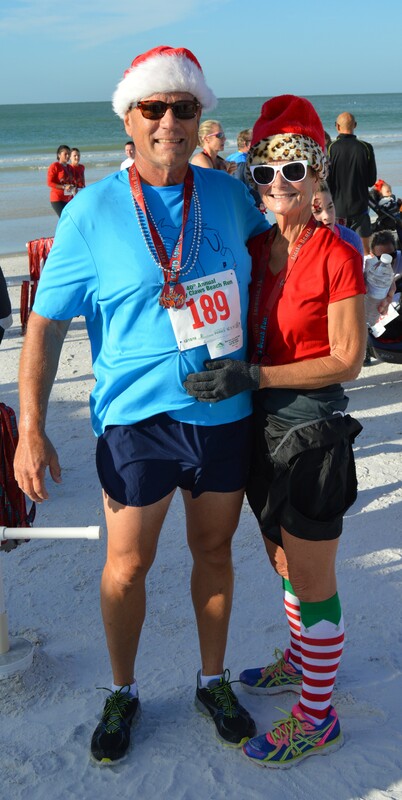 Remember the beach is 1/4 mile wide so allow time to reach the starting line! How do I enter the costume contest? Wear your finest, craziest, most creative holiday garb. If you’re in costume, you’re in the contest! Our secret judges will be viewing race participants from the moment you arrive until the winners are announced at 9:30 a.m.
Can I leave my stuff somewhere? Great question! Yes, there is a "Leave Your Stuff Here" tent in the same area where you check in and where you return for the post-race party. Where can I find the race results? The race results will be posted at the post-race party and will be emailed to you at your registered email address as soon as results are available. Where can I pick up my award? If you can’t stay for the post-race party and award ceremony you may pick up your 1st-3rd place trophy or 4th-6th place ribbon at Twin Lakes Park, 6700 Clark Road, Mon.-Fri. Dec. 11-15 between 7:30 a.m.-4:30 p.m.
What happens if it rains? This event is rain or shine. In the event of a serious weather event, Sarasota County reserves the right to cancel the race, without refund, for your safety. What if I can’t make the race? Sorry, there are no refunds. We appreciate your support of the Adopt-A-Camper scholarship program. You may pick up your event shirt and runner’s bag at the early packet pickup party at New Balance Sarasota, 1872 Stickney Point Road on Thursday, Dec. 7 between 3-6 p.m. Unclaimed shirts and runner’s bags are forfeited if not picked up by race day. If you have any other questions, please call 861-PARK (7275) or 861-5000.